There’s a whole lot’o’Holmes out there in media-ville, these days. There’s the British version, “Sherlock”, starring the wonderful Benebatch Cumberdict. And there’s the American…er…British-y version, “Elementary”, starring the wonderful Johnnie Lee Miller. Both shows are clever, procedural, and true to he original tomes. But Condon’s film, “Mr. Holmes,” is a different beast altogether…one Sir Arthur would never have considered. I suppose you might call it Sherlock’s Exotic Marigold Kent Summer Home. HOWEVER, this is no cutesy, whimsical tale. This is serious stuff with some light moments. It is less about a caper (although there most certainly is a wonderful one at its heart), and more an inspection of a life lived via logic – and the resulting ponderance of one’s findings. Oh..and this one has the greatest living actor in our universe, Sir Ian McKellen, who can express years of accumulated knowledge, utter exhaustion, and eight decades of life, longing, sadness, joy and disgust with the simple raise of an eyebrow – all at the same time! 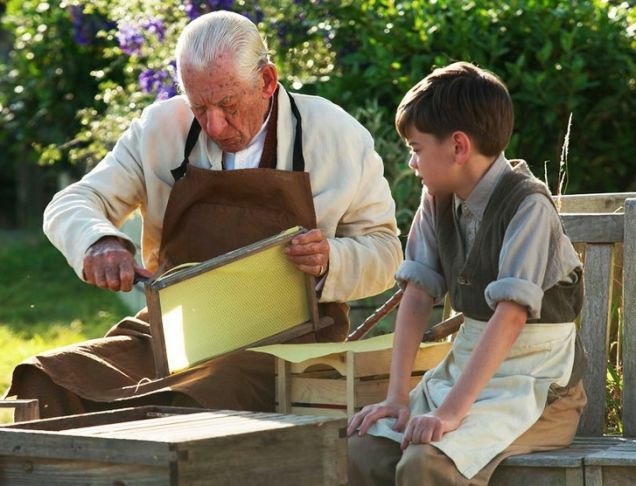 In addition to Sir Ian, there is a wonderful child actor named Milo Parker (where do they find these kids?! ), who is note perfect, throughout. And if you can forgive Laura Linney’s accent traipsing all over the UK and Ireland, she acquits herself well in a pretty thankless role. The script is unique and intricate. The photography is gorgeous, as you would imagine anything set above the chalky cliffs of Dover would be. And special props to my favorite film composer, Carter Burwell, for writing a score that fits in all the right places. To sum up, it is an intelligent film about intelligent stuff for intelligent adults. In other words, the kind of golden ticket we don’t normally get in the middle of the Summer Blockbuster season. If that idea appeals to you, don’t miss it.